Following a parliamentary question by Green Party MP Caroline Lucas, the UK government has published its official guest list for Defence & Security Equipment International 2017 (DSEI), one of the biggest arms fairs in the world. 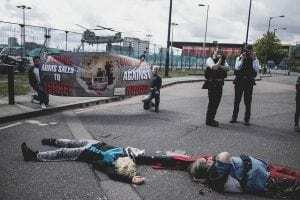 The controversial defence industry get together kicked off today in the Excel Centre in London’s docklands with news that 100 protestors have been arrested around the site so far. 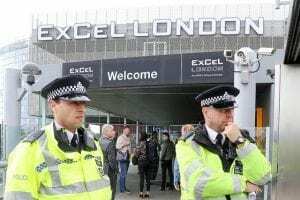 Scotland Yard said 102 people had been arrested so far mainly for allegedly blockading DSEI to stop exhibitors exhibiting their weaponry to attendees from all over the world. 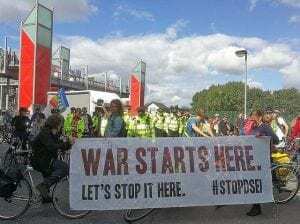 Last year eight protesters were acquitted of trying to stop the fair in a court case that ruled there was “clear, credible and largely unchallenged evidence from the expert witnesses of wrongdoing at DSEI and compelling evidence that it took place in 2015”. The full list of guests, who will be wined and dined by our public servants include regimes with appalling human rights records. These include: Algeria, Bahrain, Egypt, Kuwait, Oman, Pakistan, Philippines, Qatar, Saudi Arabia, Turkey and United Arab Emirates and Vietnam. Exhibitors such as Israel will be allowed to pitch up their pavilions. Israel has been criticised by human rights watchdogs for among other things supplying Myanmar with over 100 tanks, boats and light weapons. These sales have continued as the Burmese army have been implicated in atrocities against the Rohingya Muslim minority in Myanmar. The government and military delegations invited by the Defence and Security Organisation, which is part of the taxpayer funded UK Department for International Trade include Saudi Arabia. Saudi Arabia is criticised heavily for the horrendous civilian casualties, famine and massive cholera epidemic linked to its bombing of Yemen. Russia is also revealed to be attending – the main weapons supplier of the Assad regime in Syria, where an unprecedented refugee crisis continues to destabilise the entire region. “The arms companies don’t care where their weapons go, all they care about is profit. The entire industry is driven by war and conflict: whether it is the UK companies that have made billions from the war in Yemen, or the Russia companies making a killing in Syria,” explained Andrew Smith of Campaign Against Arms Trade (CAAT). Government statistics show that over the last 10 years, almost 60% of UK arms exports have gone to the Middle East. A survey for CAAT the week DSEI brings thousands of arms dealers to London revealed that 76% of UK adults oppose the promotion of military exports to human rights abusers. 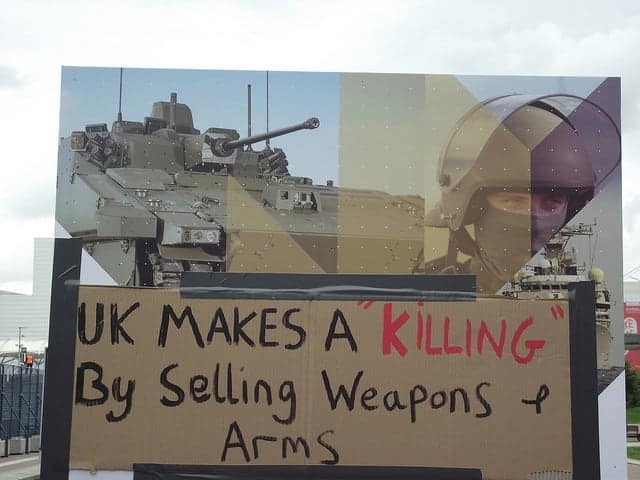 DSEI, run by Clarion Events, with full UK government support, attracts 1,500 exhibitors and 34,000 arms buyers, many from states currently at war or on the Foreign Office’s own list of human rights abusers. At recent DSEIs, campaigners exposed availability of cluster-bombs and near-torture equipment, banned by international treaties.